NEW YORK (CNNMoney) -- Newsflash! The 2011 budget saga isn't over. Everyone within 200 miles of Washington let loose a huge sigh of relief Friday night when lawmakers announced they had a deal on how to fund the government through Oct. 1. But that's not what lawmakers passed on Friday night. Instead, they voted on a one-week extension that will slash $2 billion in spending from transportation and housing programs. Lawmakers had to pass the one-week bill because the larger compromise measure hadn't been written yet. Details are sketchy as to what will be included in the longer compromise bill. It will set spending levels $38.5 billion lower than at the beginning of the year; that much is known. But the specific program cuts remain unclear. And really, it's not going to cut an additional $38.5 billion. That headline number includes $12 billion in cuts that were included in three prior short-term funding resolutions. That leaves lawmakers looking for $26.5 billion to cut from agencies and programs. Republicans hoped to make the majority of the long-term cuts from a small part of the budget -- a section called non-security discretionary spending. That section of the budget makes up roughly 12% of all federal spending, and Democrats had sought to spread the cuts to other parts to alleviate pain on some of their favorite programs. And that's what happened, at least according to Democrats. Sen. Chuck Schumer of New York, the Democratic message man in the Senate, claimed victory on Sunday. "That's what allowed us to get to that number," Schumer said on CBS's "Face the Nation." "The Tea Party folks wanted them all to come from the domestic discretionary. And it's much broader than that." 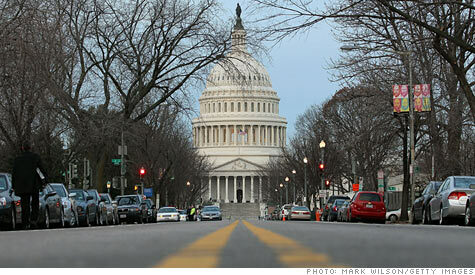 Already lawmakers have trimmed $12 billion from around the edges of the 2011 budget. That meant an end to programs that provided funds for broadband access in rural communities, education, highway construction and the Smithsonian Institution, among other things. Congressional staffers are now putting the finishing touches on the legislation, and details should be released late Monday night. That sets up a vote late in the week. The new deadline hits the end of Friday, for those still keeping track. Who gets paid in a shutdown? Congress!